Happy Thanksgiving everyone! It is my favorite holiday and I have much to give thanks for. I might keep the blog stories slow today and post the stories I have tomorrow, instead of today. But to give you all that warm and stuffed feeling of Thanksgiving, I wanted to share the logos from the search industry. Of course, Google has been leading up to their animated logo today. They had two logos in the past two days, which you can see here. I'll share the animated logo in a YouTube clip below. Yahoo has a neat animated logo, as always. 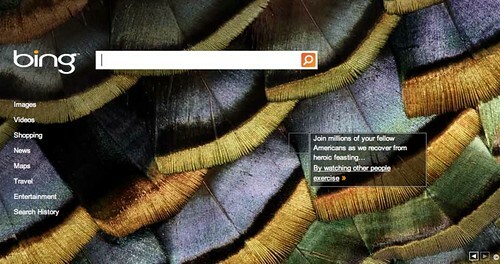 Bing has an interesting background for Thanksgiving and we have logos from Ask, Cre8asite Forums, BruceClay and from ourselves. One missing logo was from Dogpile, I miss when they don't make cute logos. As you can see, clicking on various parts of the logo take you to Thanksgiving recipes from Ina Garten. 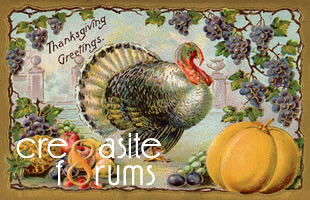 For the past years Thanksgiving day logos, see 2009, 2008, 2007, 2006, 2005 and 2004 logos. Forum discussion at Google Blogoscoped Forums, Google Webmaster Help and others.